We encourage our participants to “pay it forward” by serving as environmental ambassadors for their schools and community, through simple actions such as litter cleanups. Practicing what we preach, Nature’s Academy maintains new and ongoing projects that benefit the local community and beyond. When you become a Nature’s Academy sponsor, these are the projects your generous donations are used to promote. 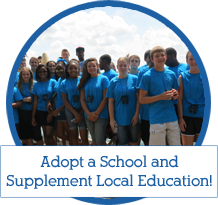 Our Adopt-a-School Program seeks community partners to support annual field trips for local schools. For just $1000, you can guarantee one fifth grade class the opportunity to attend a field trip program through our Science Literacy Project. Whether an annual or one-time donation, you can bring classrooms outdoors and enhance local STEM (Science, Technology, Engineering, Mathematics) education. Click here to learn more about the Science Literacy Project. As a Nature’s Academy supporter, you help engage future scientists in real research and field data collection. Through our programs, students use scientific methods and instruments to collect data on environmental water quality, biodiversity and litter impact. 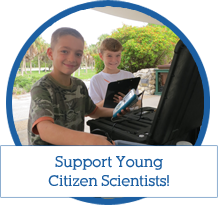 Our young citizen scientists are connected to a Gulf of Mexico-wide collaboration of researchers, nonprofits and schools, through which data and results will be tracked and compared. We provide our students with reusable water bottles as an eco-friendly way to hydrate during outdoor activities. 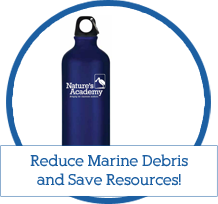 Help fund our supply of sturdy water bottles and your company logo could be featured on these tangible tools of change for students to take anywhere they go! A variety of items support the education and safety of our field trips. 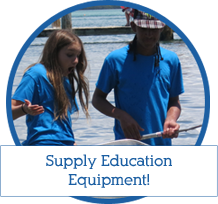 Contribute toward key tools, such as water shoes, Vernier™ water quality probes, Mimio™ handsets and more, and ensure a complete, invaluable experience for our students! Where were you at 5:00 this morning? After wrestling on her prosthetic leg, Nature’s Academy Founder and Executive Director Dana Pounds finds herself pushing the limits at the gym. 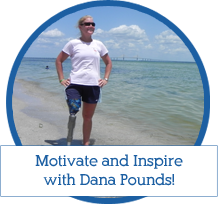 Before the break of dawn, Dana fervently trains toward her dream of running a marathon one day. With your support, we can better equip our future leaders with the inspiration and tools for environmental sustainability!